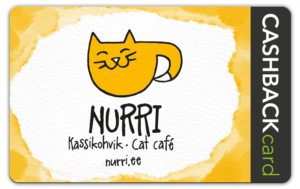 Nurri Cat Cafe was established in 2014 in Tallinn by JJ and Helen. The cafe offers both pastas, salads, ice cream and smoothies, as well as ordinary coffee and cakes. Our cats are from both shelters as well as from people. They are taken care of with full responsibility, in the best way possible. We chose kitties who love the company of people and other cats and are in good health. For the cafe hygiene, the cats are being washed and groomed regularly. If necessary, we will check their health at the veterinarian, to assure they are healthy and alright. To ensure all this, we have an additional fee for our visitors (Additional fee).